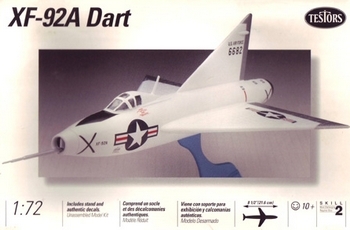 This page will show some models of American prototypes of various periods. 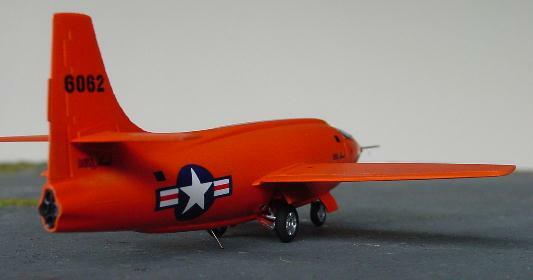 Boeing Bird of Prey "Stealth Testbed"
The Bell X-1 was the first aeroplane to reach the speed of sound, flown by Chuck Yeager on October 14, 1947. 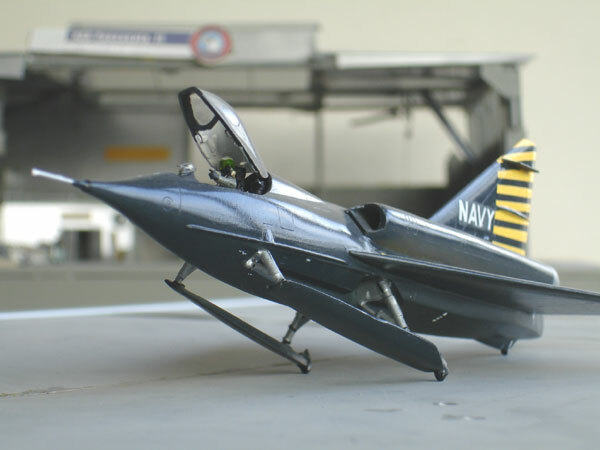 Tamiya issued a nice 1/72 model in 1992, with a solid and a transparant fuselage included. So you have the option to build several versions. Two canopies are also provided. I made two models out of it, making the extra wings from some plasticcard and making an extra undercarriage from scratch. The model from the kit is very good with nice decals. You can make it straight out of the box. 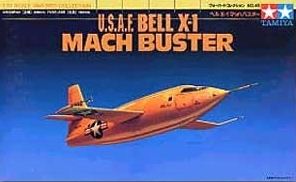 The Bell X-2 was a X-plane to investigate high speeds around 1955 and the X-2 could reach Mach 3.2 (2094 mph)! 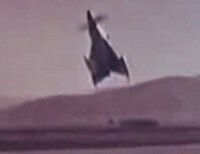 It had a simple landing skid for use in the dry lake and it had a Curtiss-Wright XLR25 rocket engine. 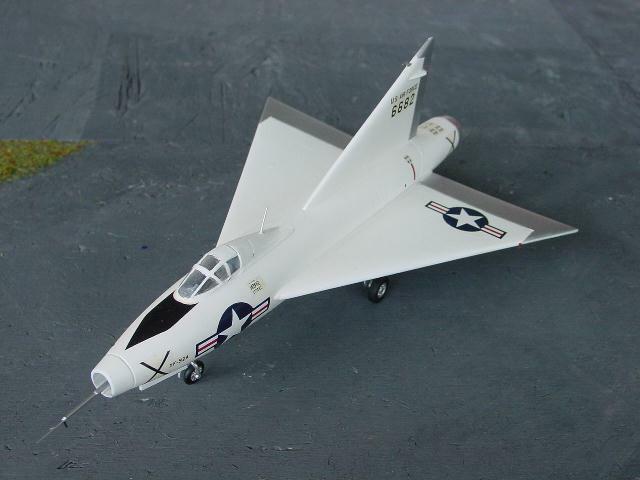 It featered a swept wing to explore high speed flight. 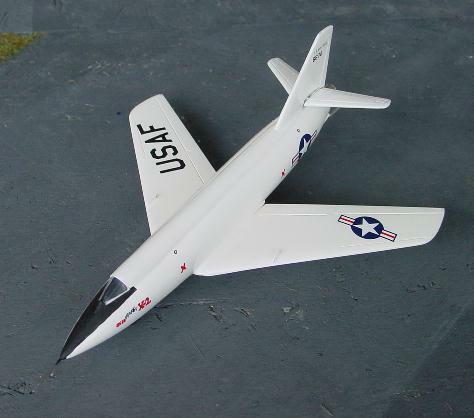 The Bell X-2 was developed to provide a vehicle for researching flight characteristics in excess of the limits of the Bell X-1 and D-588 II. 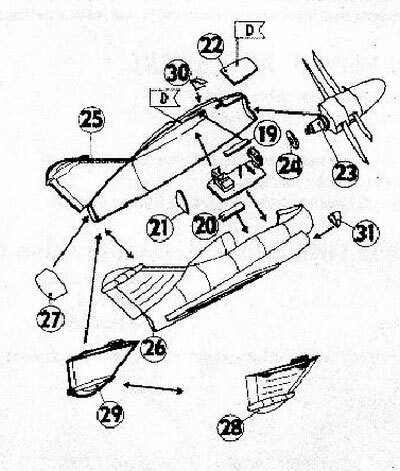 Two planes were build, both crashed. 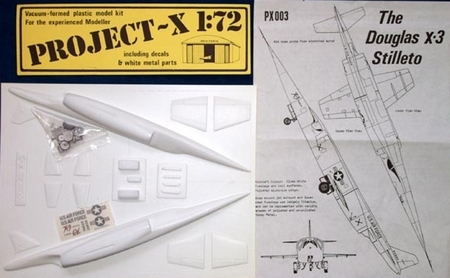 The model is a 1/72 vacuform of "Project X", the unique manufacturer of typical X-planes from the U.K. 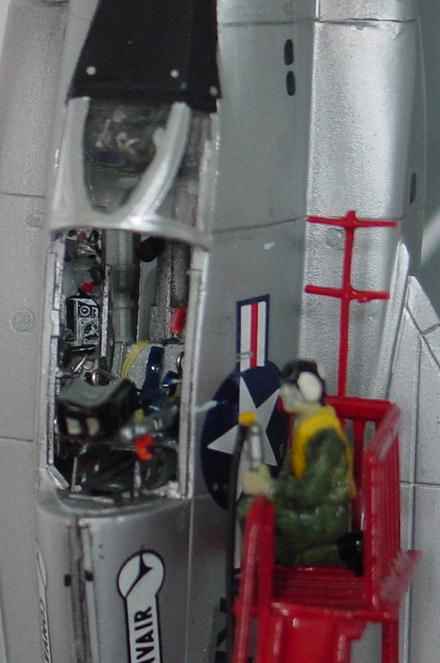 It is a good model, with some smaller metal parts, the only difficulty being a good fix of the small cockpit window. 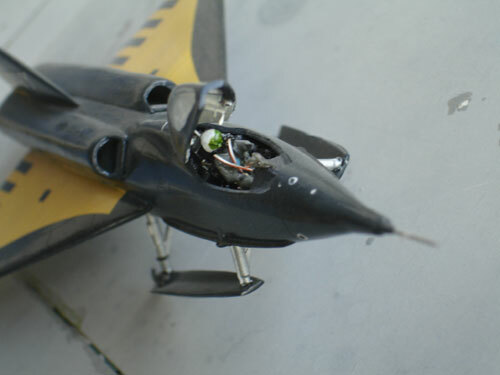 Also add the small leading edge wing fences and the pitot from a needle. 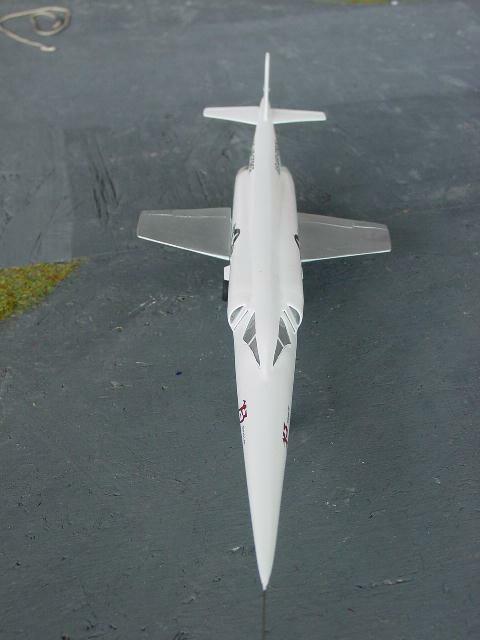 The model was finished in glossy white and a final coat of Johnson Clear applied. I could not really use the decals. Markings came from the spare decalbox and I hand painted the Bell X- logo. 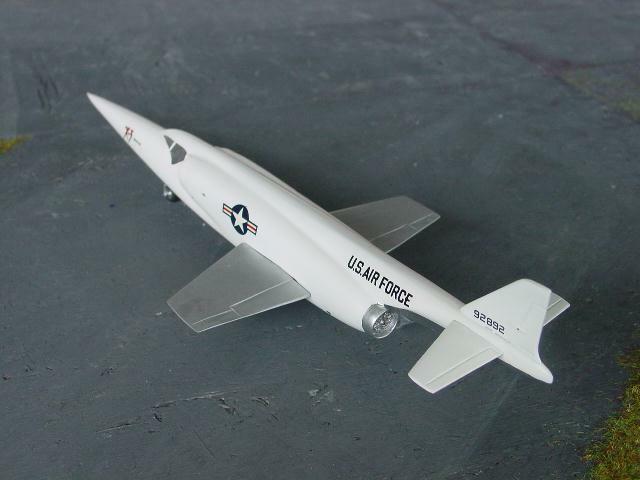 The Douglas X-3 was flown in 1952 to research data on small aspect ratio wings and turbojets. Because of its shape, it was known as the Stiletto. 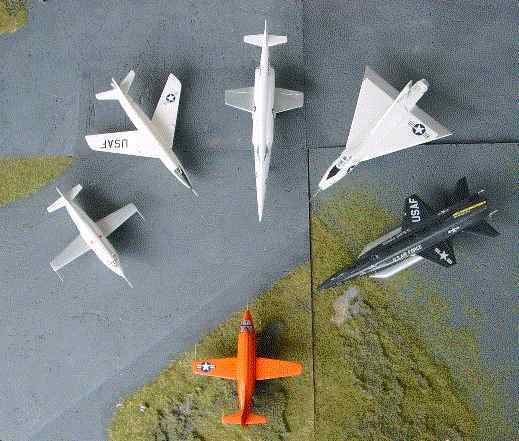 The model in 1/72 was ofProject X, the only other model being an old Revell/Aurora kit in the odd scale of 1/64. The vacuform kit can be made quite easily, only the glazing giving some work to get correct. The small wings were finished in Testors metallic. 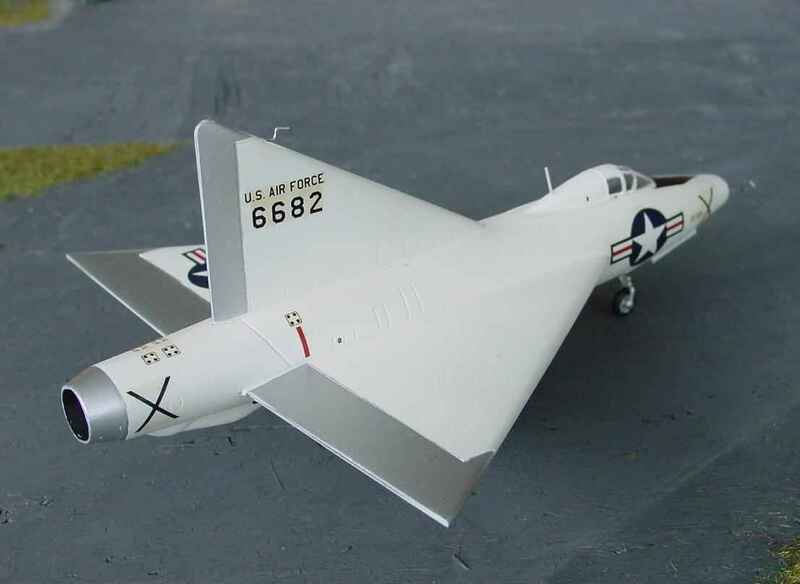 The Convair XF-92A was a X-plane to investigate the pure Delta wing. 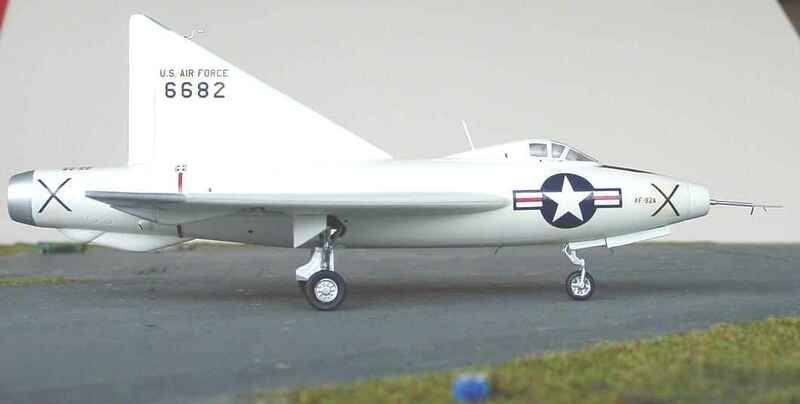 It flew in 1948 and was intended to be followed by an actual F-92 fighter aircraft. The project never came beyond the testing stage. 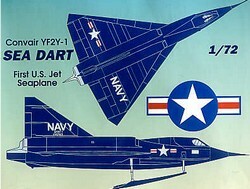 Data was later used for the F-102 Delta Dagger and F-106 Delta Dart aircraft types from Convair. 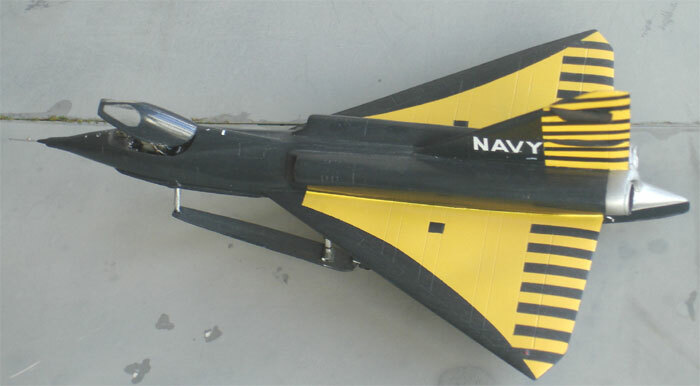 The model is a re-issued kit in 1993, (from Hawk / Aurora) by Testors in 1/72. 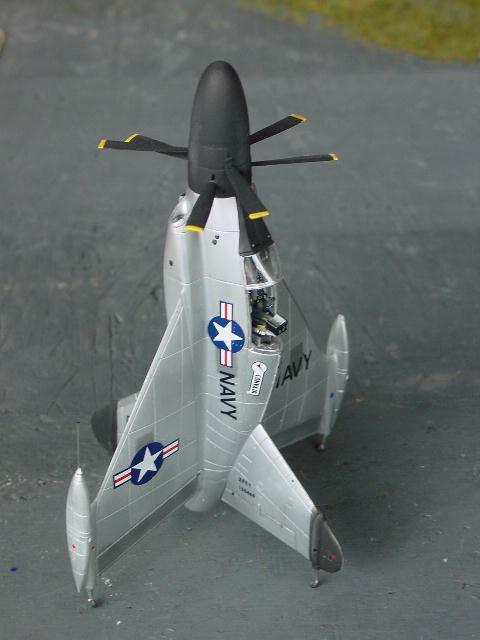 It lacks any undercarriage, which was scratch built. Otherwise, it is a good basic model. Yep, I known... decals also unfortunately turned out after some time a little yellownish.. 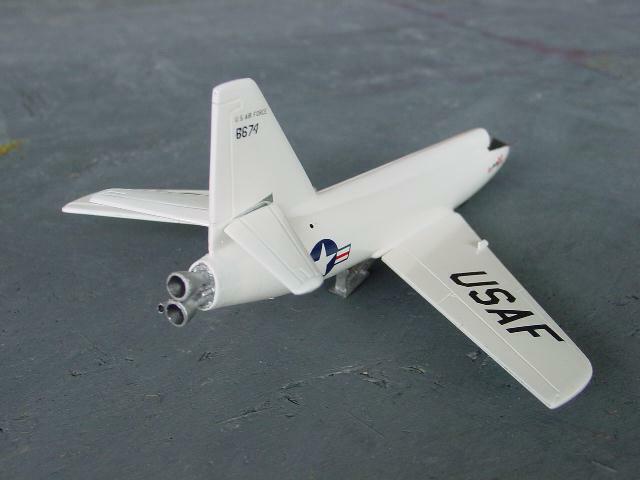 The Convair XFY-1 Pogo was a X-plane flown in 1954 to investigate VTOL and new fighter concepts. 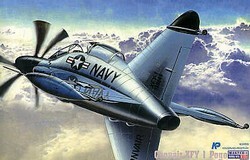 It was in competition with the Lockheed XFV-1. 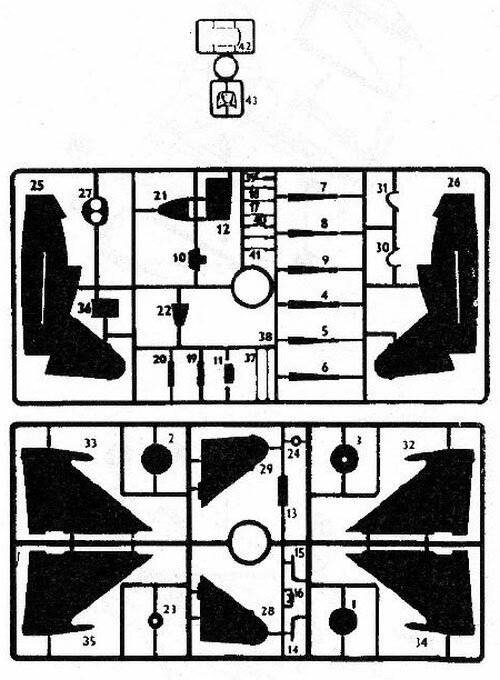 Airmodel had a very basic vacuform model, but fortunately KP from the Czech Republic issued in 1998 a very good kit #72021 in 1/72 scale. It was finally available in 1/72 as an injection moulded kit. 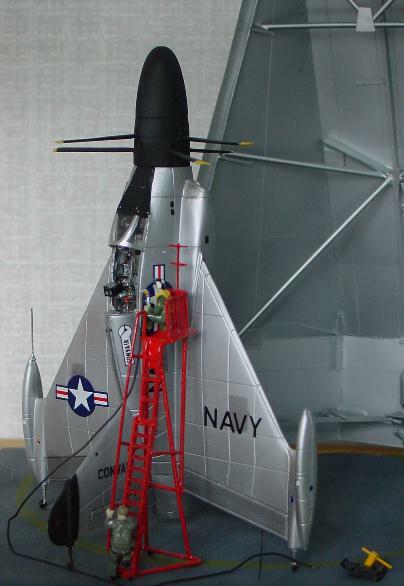 It is a very nice model, although adding some details in the cockpit will improve it. It was finished in metallic with paints from Testors. 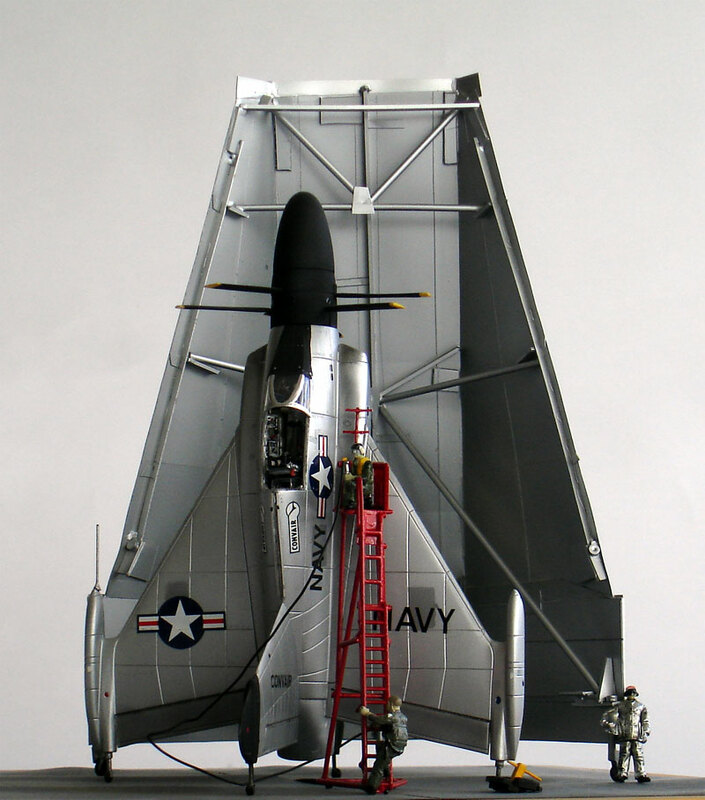 The Convair Seadart was flown in 1953 to test the strange concept of "sea going" jet fighters. 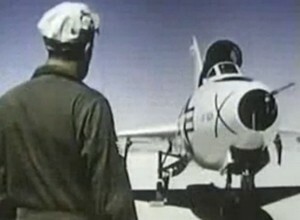 It featured a Delta Wing which was investigated with the Convair XF-92. 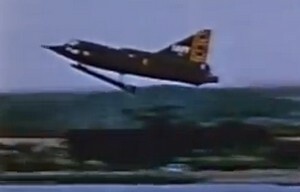 A number of aircraft were tested, it was quite stable when operating from calm water. But it suffered from accidents, corrision and other problems, leading to project cancellation in 1954. 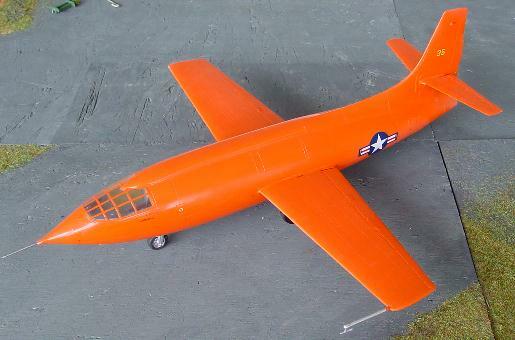 Airmodel and Execuform had very baisc vacuform models of this aircraft. 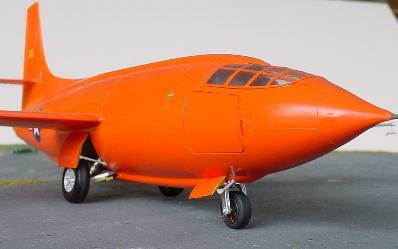 But forunately in 1/72 an injection moulded kit appeared from the French MACH2 company. The model is however rather crude although injection moulded and needs some work. You will also need to add some exhaust tubing and cockpit details. Masking the yellow markings is real challenge on this bird. This was done with fine low tack tape. Other wise the model had no problems, the canopy was set open. - Janes pocket book #12 on research ? 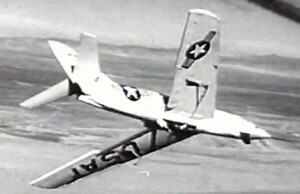 experimental aircraft.